Romello Wilson is from St. Paul Minnesota and has with him a 60-card Zombie Lightsworn Deck. He has an undefeated record. 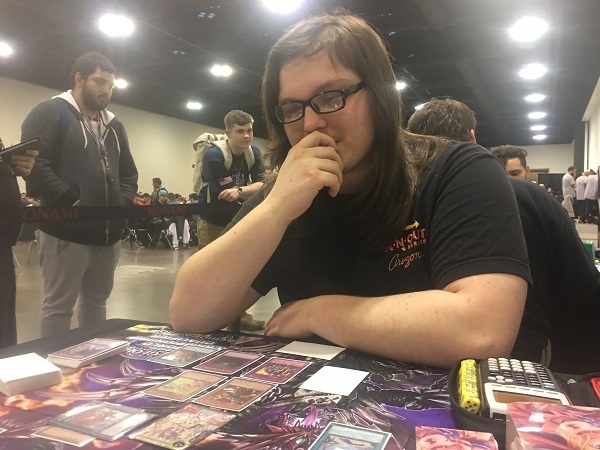 Tyler Holland is from Florence, Kentucky and has 4 wins and a draw with a Card of Demise variant for True Draco. Who will keep their undefeated streak alive? Let’s find out! It’s time to Duel! Holland won the roll and elected to go first. Wilson started with a hand of Mezuki, Predaplant Darlingtonia Cobra, Lonefire Blossom, Mezuki and Soul Charge. Holland started with Spellbook Magician of Prophecy, which got Spellbook of Secrets from the Deck, and that added Spellbook of Knowledge, which was activated, sending Spellbook Magician of Prophecy to the Graveyard to draw 2. Next, Pot of Duality was activated, revealing Terraforming, Master Peace, the True Dracoslaying King and Waterfall of Dragon Souls. He picked Terraforming which was activated to add Dragonic Diagram from Deck to hand. He Set True King’s Return and activated Dragonic Diagram, using the effect to destroy True King’s Return to add Disciples of the True Dracophoenix to his hand. He activated a second copy, then Set Disciples of the True Dracophoenix and used the second Dragonic Diagram to destroy Disciples of the True Dracophoenix and add True Draco Heritage. True Draco Heritage was activated to draw another 2 cards. He then used the Tribute Summon effect to Tribute True Draco Heritage to Summon Ignis Heat, the True Dracowarrior. He Set 3 and passed. Wilson drew Lumina, Lightsworn Summoner for turn. Holland activated Anti-Spell Fragrance. Wilson Set Mezuki and Soul Charge and passed. Holland activated Dragonic Diagram, destroying an in-hand Secrets to add Majesty Maiden the True Dracocaster from Deck to hand. Then, Holland Tributed his face-down Apocalypse for Majesty Maiden, the True Dracocaster. He used True Draco Apocalypse’s effect to destroy the face-down Mezuki and attacked with both monsters. Wilson drew Gold Sarcophagus for turn, not useful against an active Anti-Spell Fragrance. He Normal Summoned Lonefire Blossom. He activated the effect, and Holland chained Ignis Heat, the True Dracowarrior to activate Disciples of the True Dracophoenix from the Deck. Wilson resolved Lonefire to Special Summon Predaplant Ophrys Scorpio. Next, Soul Charge was flipped-up and Holland chained Majesty Maiden to search for Master Peace, the True Dracoslaying King. Soul Charge Special Summoned two monsters, and Wilson flipped up Skill Drain. Wilson conceded the Duel at that point. Wilson elected to go first. He started with a hand of Lonefire, Shiranui Solitaire, Soul Charge, Left Arm Offering, and Pot of Desires. He started with Lonefire, Tributing it to Summon a second one, then Tributing that for the third, then Tributing that for Predaplant Ophrys Scorpio whose effect discarded Shiranui Solitaire to Summon Predaplant Darlingtonia Cobra. Its effect searched Brilliant Fusion, and the 2 monsters were used to Summon M-X-Saber Invoker. Its effect Summoned Heroic Challenger – Thousand Blades, then both monsters were used to Link Summon Missus Radiant. Then Brilliant Fusion was activated, sending Gem-Knight Garnet and Performage Trick Clown to Fusion Summon Gem-Knight Seraphinite. Performage Trick Clown then was Special Summoned then Thousand Blades alongside it. Next, Pot of Desires came down, banishing 10 cards to draw Performage Hat Tricker and Charge of the Light Brigade. Next, Charge of the Light Brigade was activated, hitting Gold Sarcophagus, Solemn Strike and Predaplant Ophrys Scorpio to add Raiden, Hand of the Lightsworn to hand. Raiden, Hand of the Lightsworn was Normal Summoned, hitting Predaplant Ophrys Scorpio and Goblindberg. Next, Raiden, Hand of the Lightsworn and Performage Trick Clown were used to Xyz Summon Minerva, the Exalted Lightsworn. Her effect hit Wulf, Lightsworn Beast, Performage Hat Tricker and Fairy Tail – Snow. Wilson drew Ghost Ogre & Snow Rabbit and Special Summoned Wulf, Lightsworn Beast. Wilson then Special Summoned Performage Hat Tricker. He then Link Summoned Curious, the Lightsworn Dominion using Missus Radiant, Performage Hat Tricker and Thousand Blades. Curious’s effect sent Mezuki to the Graveyard and Curious, the Lightsworn Dominion’s other effect sent Foolish Burial, Pot of Desires and Ghost Ogre & Snow Rabbit to the Graveyard. Mezuki was banished to Special Summon Shiranui Solitaire, which was Tributed for Uni-Zombie, and Uni-Zombie was activated to increase Wulf, Lightsworn Beast’s Level and send Mezuki from Deck to Graveyard. Next, Uni-Zombie and Gem-Knight Seraphinite were used to Synchro Summon PSY-Framelord Omega. Next, Mezuki’s in-Graveyard effect Special Summoned Uni-Zombie and it and the Level 5 Wulf, Lightsworn Beast were used to Synchro Summon another PSY-Framelord Omega! The second PSY-Framelord Omega’s effect was used to banish Wilson’s Pot of Desires and the first one hit Holland’s True Draco Heritage. Wilson then activated Soul Charge, Special Summoned Fairy Tail – Snow, Performage Hat Tricker, Goblindberg, and Raiden, Hand of the Lightsworn, dropping to 3000 LP. Next, Abyss Dweller and Tornado Dragon were Xyz Summoned. He Set Left Arm Offering and passed. Wilson activated Abyss Dweller in Holland’s Standby Phase. Holland Normal Summoned Spellbook Magician of Prophecy and activated its effect to add Spellbook of Secrets to hand. That was activated to add Spellbook of Knowledge. After the Chain resolved, Wilson activated his in-Graveyard Fairy Tail – Snow, Special Summoning it and turning Spellbook Magician of Prophecy face-down. Holland then activated Terraforming to add Dragonic Diagram to his hand. The Field Spell was activated and Wilson chained Tornado Dragon’s effect. Holland Set a card and activated Card of Demise to draw 2 cards. His draws were visibly disappointing, and he conceded the Duel. Holland elected to go first in Duel 3. He started with Pot of Duality, revealing Inspector Boarder, Imperial Iron Wall and Terraforming. That was activated to add Dragonic Diagram, which was activated. Holland then Set True Draco Apocalypse, and Dragonic Diagram destroyed it to add Disciples of the True Dracophoenix to hand. Disciples of the True Dracophoenix was activated and Holland used the additional Summon to Tribute Summon Majesty Maiden, the True Dracocaster. He Set a card and activated Card of Demise to draw 2. He then activated Pot of Desires, banishing 10 cards to draw 2 more. He activated another Dragonic Diagram and used the effect to destroy Spellbook of Knowledge from hand to add True Draco Heritage. He then activated Terraforming for the third Dragonic Diagram, then used True Draco Heritage to draw 2. He activated the third Dragonic Diagram, and activated its effect, destroying Pot of Desires from his hand to add Majesty Maiden, the True Dracocaster. He then used the additional Normal Summon from True Draco Heritage to Summon the second Maiden. Holland then Set the remainder of his hand and passed. Wilson drew Charge of the Light Brigade, adding it to his hand of Performage Damage Juggler, Mezuki, Pot of Desires, Fairy Tail – Snow and Reinforcement of the Army. Reinforcement of the Army was activated and Holland Chained a Maiden to add Master Peace, the True Dracoslaying King to hand. Reinforcement of the Army added Goblindberg. Pot of Desires came down next, banishing 10, and the second Maiden was Chained, adding the third Majesty Maiden. Wilson drew Mezuki and Predaplant Ophrys Scorpio. Charge came down next, hitting Performage Trick Clown, Fairy Tail – Snow and Shiranui Solitaire, and adding Raiden, Hand of the Lightsworn from Deck to hand. Performage Trick Clown was Special Summoned at the cost of 1000 LP. He then Normal Summoned Goblindberg and tried to use the effect but Holland Chained The Monarchs Erupt to negate the effect. Wilson thought for a moment before using the 2 monsters to Xyz Summon Minerva, the Exalted Lightsworn. He went into the Battle Phase and crashed into a Maiden trying to use Minerva, the Exalted Lightsworn’s Graveyard effect to destroy something, but the effect hit Brilliant Fusion, Ash Blossom & Joyous Spring and Ghost Ogre & Snow Rabbit. He passed with an empty field. Holland used Dragonic Diagram, destroying Inspector Boarder to add Disciples of the True Dracophoenix to hand. Its effect sent Disciples of the True Dracophoenix, True Draco Apocalypse and True Draco Heritage back to the Deck to draw 1 card. He then used Disciples’s other effect, Tributing it and a Majesty Maiden to Tribute Summon Master Peace, the True Dracoslaying King. On Master Peace, the True Dracoslaying King’s attack, Wilson discarded Performage Damage Juggler to reduce the damage to 0, then Maiden hit for 2600. Holland Set one to the back and passed. Wilson drew Droll & Lock Bird for turn. Wilson activated the in-Graveyard Performage Damage Juggler to add Performage Hat Tricker to hand. He then Special Summoned Performage Hat Tricker and Normal Summoned Mezuki. He used the 2 monsters to Link Summon Missus Radiant. Next, Mezuki was banished to Special Summon Shiranui Solitaire. He then used Fairy Tail – Snow’s effect to Special Summon it, then all of the monsters were used to Link Summon Borreload Dragon. Before going into the Battle Phase, Holland activated the face-down True Draco Apocalypse, Tributing it to Tribute Summon Majesty Maiden the True Dracocaster and the in-GraveyardTrue Draco Apocalypse destroyed the Borreload Dragon. That was enough to end it! Holland moves on with 5-0-1 record! 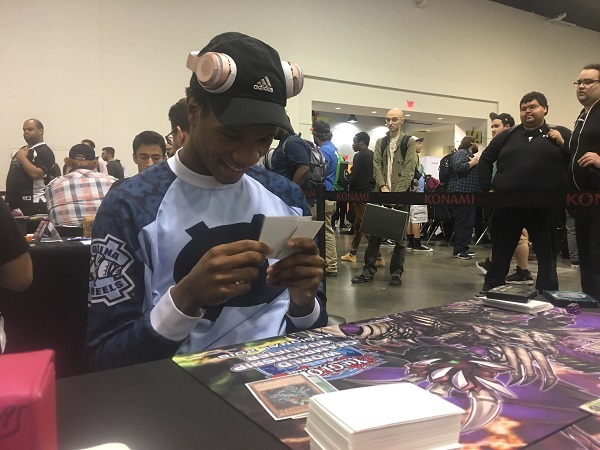 YCS Atlanta Top Tables Update: Round 8 YCS Atlanta: Round 8 Pairings!